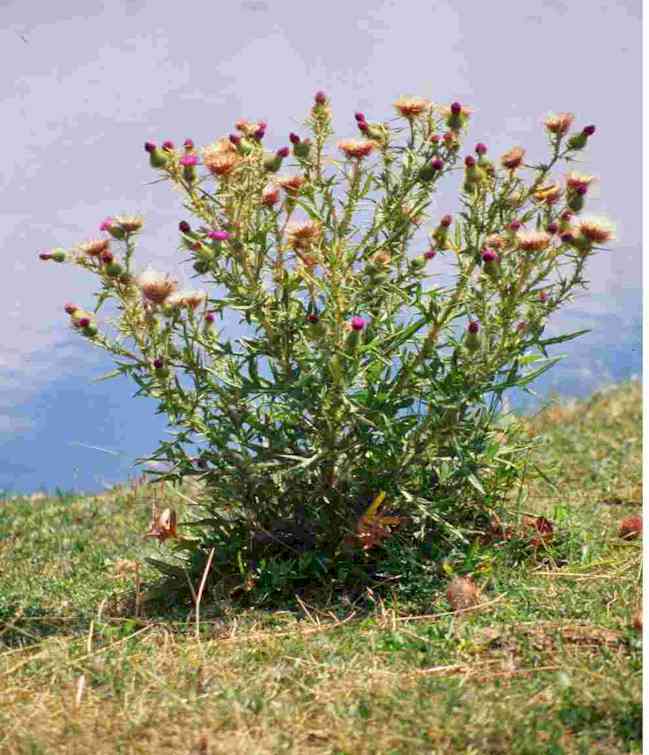 Bull thistle is a large, coarse, tap-rooted biennial plant that grows up to 7 feet tall. Rosette leaves are pubescent, oblong in shape with small spines at the tips of deep lobes. Flowering plants have a few to many branched stems covered with fine white hair resembling cobwebs. Stem leaves are spiny and alternate, and the leaf blades grow along the leaf stem giving them a “winged” appearance. Each branch produces one or more large flowerheads about 2 inches in diameter and surrounded with stiff spiny bracts. The flowers are rose to purple, maturing into pale brown seeds with dark streaks and a feathery plume of bristles growing from one end. Growth Stage for Treatment: Graze bull thistle heavily during the rosette to bolting stage. Repeated grazing at approximately two-week intervals will be necessary to prevent flowering and seed production. May need to graze only once in a season if grazing occurs in the early flowering stage. A minimum of three successive years of grazing is needed to reduce populations. Potential Effectiveness: Sheep and goats will readily graze bull thistle. Cattle will not graze bull thistle beyond the late bud stage. Grazing works best when combined with a fall herbicide treatment. Grazing reduces plant size, density, and reproductive efficiency.